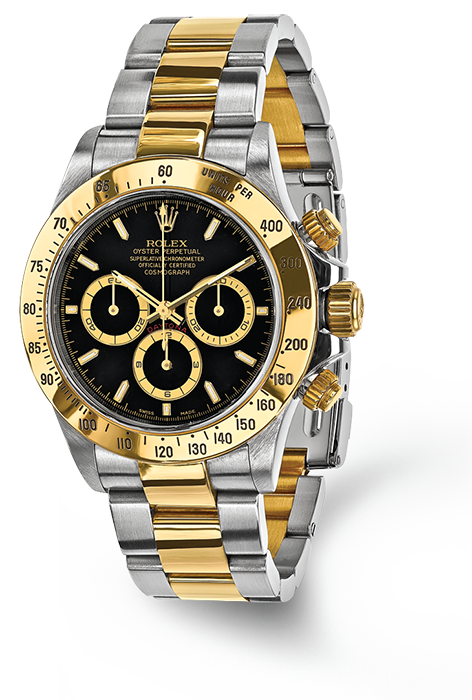 Dominic’s Fine Jewelry is your local pre-owned Rolex dealer located in Sterling Heights. If you wish to buy used authentic Rolex watches, we have access to a wide selection of authentic Rolex watches backed by our limited liability warranty. Let us help you find your dream Rolex today! What are the standards of selection? Only the finest, highest quality watches are hand selected and sourced worldwide by a team of expert buyers. Each pre-owned watch must meet stringent criteria, and bracelets must have less than 20% – 25% wear. Each certified pre-owned watch is presented in green leather hand sewn boxing accompanied by complete certification documents. Third party independent certification, including full disclosure of which parts have been enhanced, is provided to ensure authenticity and adherence to strict high quality standards. 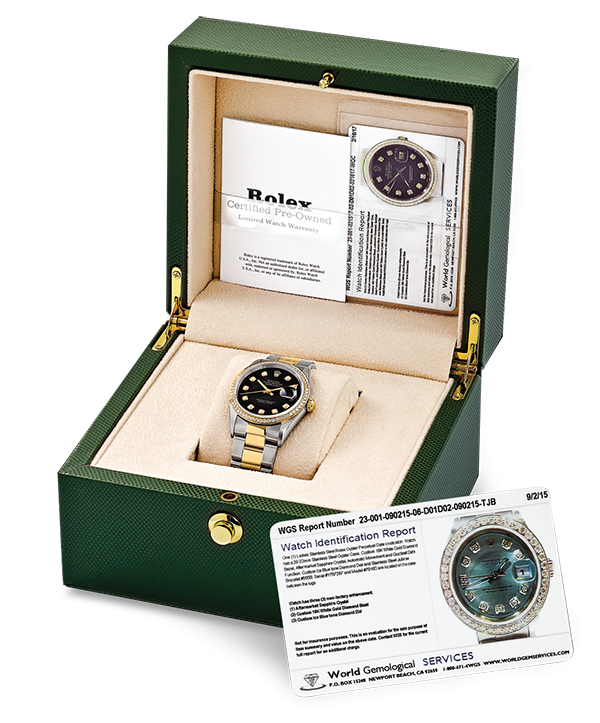 Each certified pre-owned watch is presented in green leather hand sewn boxing accompanied by complete certification documents. How can I be sure the watch is genuine Rolex? All pre-owned Rolex watches are disassembled down to the main dial plate to confirm authenticity. In addition, third party independent certification is included, which verifies the watch model number and serial number. What kind of replacement parts are used if needed? Only new, genuine Rolex parts are used to replace worn internal and external parts (except crystal) for proper functionality of the timepiece. Who works on the watches? The team of expert technicians working with the pre-owned Rolex timepieces are certified as fine watchmakers with CW21 credentials (www.awci.com). This is the most widely known and reputably accredited certification available worldwide. All watch crystals are replaced with brand new non-factory sapphire crystals to ensure a perfect like-new appearance. All Rolex seals and gaskets are replaced and watches undergo pressure and vacuum testing to ensure water resistance for years to come. How can I be certain of the quality? Every watch undergoes an extensive quality control process at every stage of handling, before and after certification, and is additionally re-checked prior to shipping. What work is done to each watch? Each watch goes through a complete overhaul. Quality control tests are conducted to verify authenticity. Accuracy of time is verified on an electronic time graph. Pressure testing takes place on a Witschi Chrono proof machine to ensure water resistance. All gaskets and necessary parts are replaced. Every watch is serviced by CW21 certified watchmakers and then polished. What are the watch features? Constructed of stainless steel and 18k gold, all of the watches feature 29 or 31 jewel automatic perpetual movement. In addition, only SI quality or better diamonds are used on watch dials and bezels. All of the Certified Pre-owned Rolex watches come complete with a limited liability warranty, covering full mechanics for two years from date of sale. What models and years are available? Our program makes available the Presidential 18KT Yellow Gold, Datejust, Diamond Datejust, Datejust II, Explorer II, Submariner, Sea Dweller and Daytona models. The program assortment featured range in serials from 1985-2005. Primarily pieces from 1990-1998 are in stock and readily available.